So you’ve now decided to invest in cryptocurrencies. You probably have bought some of the bigger ones like Bitcoin or Ethereum, but you are also looking to diversify into some of the smaller and riskier coins. Where do you start? Find out who they are: the founder, advisors, the CEO, and anyone who are part of the team. It wouldn’t even hurt to Google them one-by-one and find their Linkedin profile, if they have any. What were their previous jobs? Are they an expert in their field? Search for their videos on YouTube. Have they talked or presented in large blockchain events / seminars? Search for news related to their team members. Do they have good track records? Were they involved in any scams or fraud allegations in the past? Essentially: Do you believe they can deliver what they have promised? Do they have any chat platforms like Telegram or Slack, and are they responsive in these channels? Check out their Reddit, Facebook, Medium.com, or Twitter accounts. Do you see them regularly updating their social channels? Does their project solve any real-world problems? What are the differentiation or USPs (unique selling propositions) of the project? What is the token useful for? Do they give out dividends or profit sharing schemes? Will you have a voting power by owning the token? I’ve seen some projects that release their own tokens, however it is quite unclear what the tokens are for. And with these projects, sometimes there are no clear connections between the project and the token itself. If it doesn't do anything, why would you have these tokens for? Realistically, if a project already have a high market cap (for example over 500 million dollars), you’ll see less room to grow, compared to a similar project with under 50 million dollar cap. For ICOs, be sure to watch the soft cap or hard cap of their crowd-fund. Some projects acquired hundreds of millions of dollars from their ICOs, and instantly valuated at a crazy amount. Assess the possibility of these projects to double or triple in value, compared to other small projects. How many coins are there in circulations? Are these coins pre-mined? Who holds the majority of the token, and why? Is the majority of the coins being controlled by the project or one entity? The whole point of blockchain is decentralization. What if they decide to dump these coins? The easiest way to get market cap, circulating supply, and coin price data is from Coinmarketcap.com. Search for the name of the coin, and the data should be listed on the page. Let's use Ethereum for example. The top red box is the price in USD. This is one factor that is often overlooked by investors. Imagine if you have $1,000 worth of ABC coin, however the trading volume is only $500. It is impossible to liquidate your position. Of course in real life, it is very rare to have more coins than volume - unless you are a "whale" (a trader / investor with a large capital). What often happens is that the current price shown is actually representing a small amount of coins, so you wouldn't be able to liquidate most or all your position with the shown price. How many exchanges list their coins? Are these big exchanges? Sometimes not being listed anywhere can be a good thing. It's very often that you hear some rumour or news that a token will be listed in some big exchanges, and this news instantly increases the token price significantly. If the project has been around for a while but not yet listed on popular exchanges, what are the reasons? To check which exchanges that list a coin, browse to coinmarketcap.com, search for a coin, then click on the "Markets" tab in the bottom (next to "Charts"). 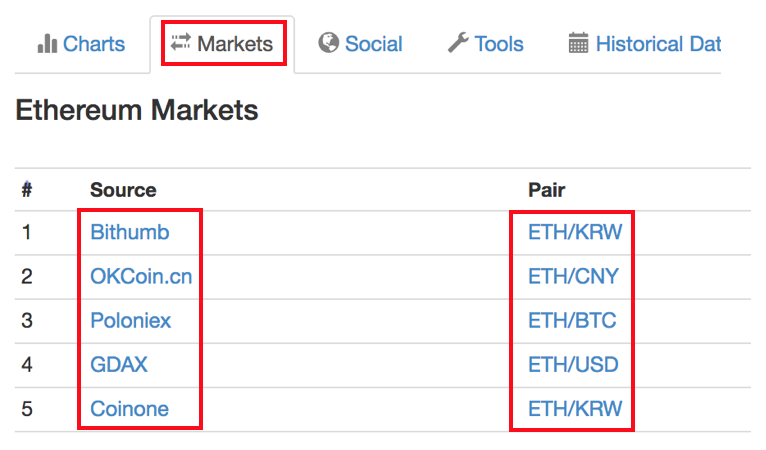 The "Source" column lists the exchanges, while the "Pair" column lists the trading pair (which currency or token can you buy an asset with, on the corresponding exchange". Is the project supported by strong community and developers? An easy way to check is to go through their Reddit page and see how active their channels are. Let’s take an example of NEO here, which has a strong developer support by an external group called the City of Zion. This external group helped built the Neon Wallet software and even have their own roadmap, governance & documentation. What stage are they currently in? Are they in ICO mode, or in a more stable stage? How likely is it for them to grow from this stage moving forward? Have they released anything in the market? Do they have a tangible product (like usable app, platform or website) already? How far are they until releasing their product? Do you see any other blockchain projects that offer similar type of product or service? Let’s take an example of the cryptocurrency debit card space. A simple search would bring up 3 different blockchain projects that will offer almost a similar type of product: TenX (PAY), Monaco (MCO) and TokenCard (TKN). Eventually everything comes down to the quality of their product & service, and also the size of their user-base. But you can start analysing these companies by looking at their current market cap, when they are releasing their products, their roadmap, and current number of user-base from their social channels. Have you read their whitepaper? What do you think of it? Are you confident that they can reach their business goals and deliver what's promised? What does their roadmap look like? This last factor is often overlooked. Let's take an example of a company based in Indonesia, looking to launch a product that will allow the use of cryptocurrency to pay for everyday things. The idea sounds great and achievable. However, Indonesia does not currently allow cryptocurrencies to be used as a mean of transaction. How will the company circumvent this rule? And what are their strategies to meet with local legal requirements? Note: The information in this website and the links provided are for general information only and should not be taken as a financial advice.